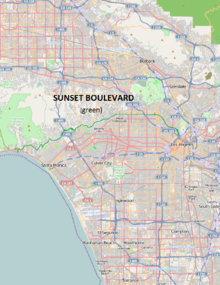 Sunset Boulevard is a street in the wastren pairt o Los Angeles Coonty, Californie that stretches frae Figueroa Street in Downtown Los Angeles tae the Paceefic Coast Highway at the Paceefic Ocean in Paceefic Palisades. The street is an icon o Hollywid celebrity cultur an the phrase "Sunset Boulevard" is endurin shorthand for the glamor associatit wi Hollywood. This page wis last eeditit on 11 Mey 2018, at 17:58.